Signs of aging start to become more apparent as people start to reach middle age. Many people start to think about a facelift once the signs of aging are becoming obvious. People from their 30’s to late 70’s may want to get a facelift in order to help them look years younger. Dr. Hardesty has developed a unique treatment plan for women and men interested in facial rejuvenation. Thus, fulfilling Imagine Plastic Surgery’s motto “One Goal, Many Options”. 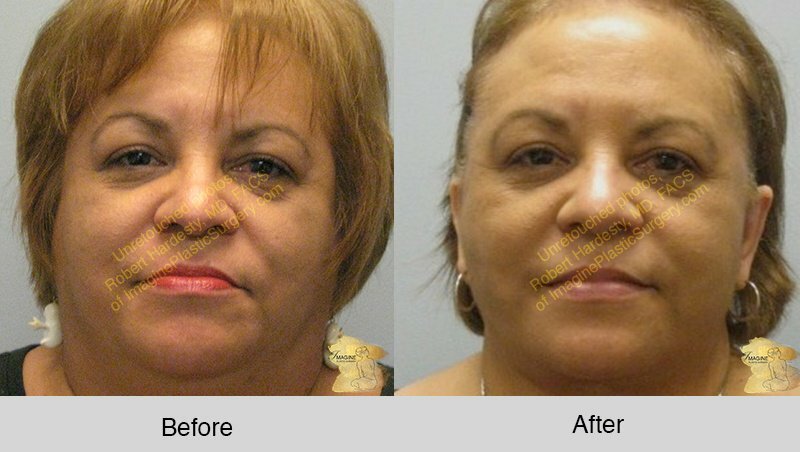 A facelift procedure is a broad, nonspecific name applied to many rejuvenation techniques. Medically speaking it is also called a rhytidectomy. Skin elasticity starts to fade as we get older, and this causes visible signs of aging that sometimes makes us look older than we feel. Common to the different facelift techniques is that each is used to help improve the visible signs of facial aging. 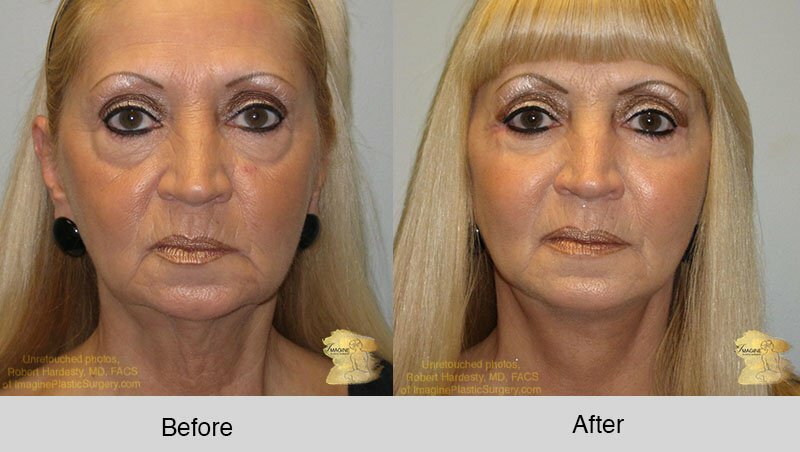 Specific face lift procedures will address and treat many concerns on the face such as “turkey gobbler” neck, neck bands, jowls, and wrinkles from excess sagging skin, excess skin, dense grooves from the base of the nose to outer lips and sagging cheeks. 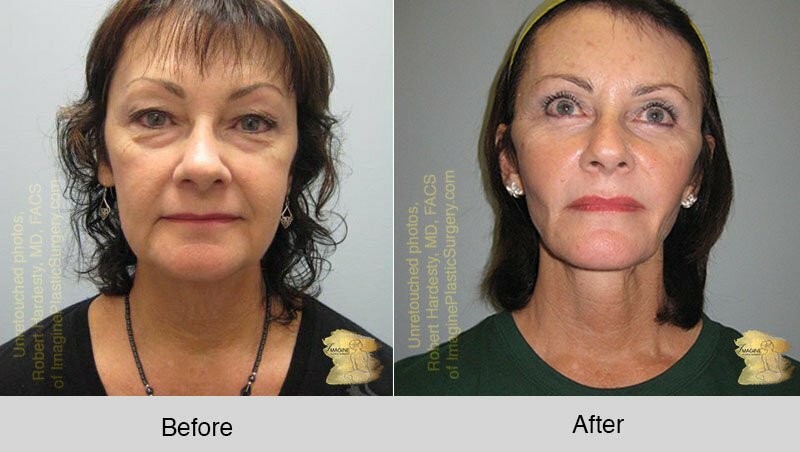 Using the specific facelift technique with other adjunctive procedures such as fat grafting, laser, and orbital rejuvenation we here, at Imagine Plastic Surgery, refer to as “Synergy”. Our goal in using these combined procedures in a comprehensive plan is to have you look 10 to 15 years younger in a natural way. Depending on the type of facelift needed, Dr. Hardesty will utilize hidden incisions that, when healed, will be virtually unnoticeable. Using these small access sites around the ears and under the chin Dr. Hardesty will tighten the underlying uncles, elevate the skin, and remove the excess skin and tissue that causes the premature aging, sagging, or dense lines. Then the muscles and underlying tissues are tightened, and the skin is gently re-draped without tension, resulting in a natural sleek and youthful appearance. By having a properly designed facelift, you are not only rejuvenating your facial features, returning to a more youthful and natural appearance, but also adding to your confidence level. Depending on the results desired as well as the current state of your skin and underlying tissues, Dr. Hardesty will choose a treatment option that will help you reach your aesthetic goals. Plan on spending an hour meeting with Dr. Hardesty for a consultation. He will listen to your concerns review your medical record, perform an examination and help create a unique and customized plan for your facial rejuvenation. Dr. Hardesty takes precautions to position the incisions in the most inconspicuous locations. The location choice depends upon the extent of the procedure. Small incisions may be made at key locations along the hairline and ear. Best for early signs of facial aging. A tiny incision in the temporal scalp hair and a small intra oral incision is all that is usually needed. Utilized often for isolated droopy cheeks. 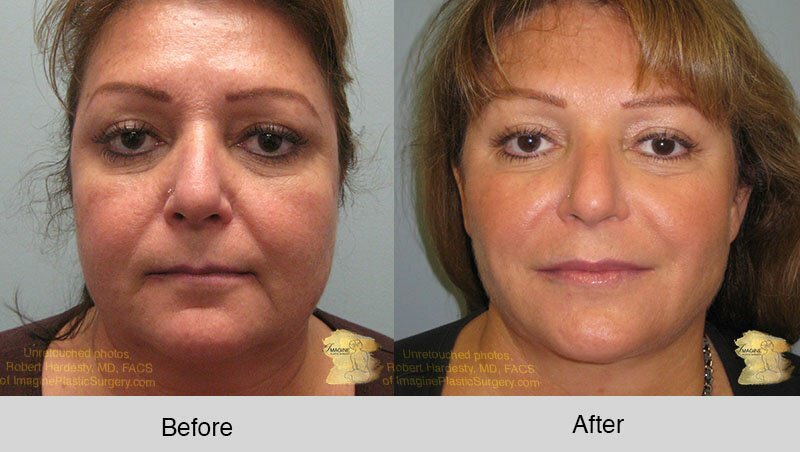 This procedure often combines the incisions of mid facelift and SMAS facelift. Best for elevating and repositioning sagging muscles groups. The traditional neck lift is a more isolated facial procedure that only involves tightening the neck musculature, resecting excess skin and fat. The hidden non-conspicuous incisions are similar to that of a full facelift. Reposition one or more underlying tissue layers to reframe the face. Excise excess redundant skin and re-draping of the skin without tension above the renewed contours of the tightened muscles of face resulting in youthful and natural appearing neck and face without appearing “overdone”. Dr. Hardesty often will complement the chosen face lift with other synergistic procedures to enhance the overall effect. The goal is to rejuvenate and harmonize the whole face resulting in a complete, youthful, and natural appearance of the entire face. Laser resurfacing or the use of RF (radio frequency) to remove the small, superficial, and fine lines of entire face. Chin implants are used when there is a “weak chin”, small chin, or chin that makes the neck less sculpted because the chin is not protruded. Dr. Hardesty will give you detailed instructions for pre-operative care as well as post-operative care. You may be given a compression garment to wear to help with swelling of the face and neck. For the easiest recovery period, follow the instructions as closely as possible. Dr. Hardesty will provide anti bruising medication, ultrasound treatments, to reduce and help normal expected swelling to resolve, and a anti scar-program. The results can be seen immediately but may take several weeks for the new contours to become completely appreciated. It is important to wait several weeks before returning to full exercise. The cost of a facelift varies between patients. Costs vary due to the doctor’s experience, area where they practice, and the costs of using the facility as well as other medical costs. If you have any financial concerns, talk with our team at Imagine Plastic Surgery. They will be able to answer any questions you may have. How Do You Sleep After a Facelift? After a facelift procedure, it is important not to sleep on your stomach or side. Sleeping reclined with some pillows is the best practice for recovery. How Long Does Swelling Last After a Facelift? Immediately following the procedure, you will experience some significant swelling of the face and neck. This should slowly start to degrade over the next few days, but you may still experience some minor swelling up to 6-8 weeks post-op. If you are interested in learning more about the facelift procedure, then contact our team today. Call the office, fill out out our self assessment survey or fill out an online form to make your consultation appointment with Dr. Hardesty.